This book contains 60 pages with 91 inventive designs. It includes abstract designs, sinuous snakes and fish, stylized birds and improbable four-legged creatures. 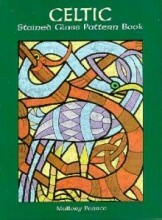 If you enjoy the fluid motion of Celtic knots, this is a good book to add to your library. Click the button below to add the CELTIC STAINED GLASS PATTERN BOOK to your wish list.